While I'm busy having fun in Virginia Beach, Brenna, AKA Perfectly Imperfect Mom, is guest posting for me! If you don't follow her already, head over to her blog and meet her adorable family! Hi there! I am Brenna and I Blog over at Perfectly Imperfect Mom. I am guest posting today for Stefanie today. First, let me tell you a little bit about myself. I am a Mom to three little ones; Ace who is 4, Ashlyn who is 22 months and Everly who is 17 months. You might be wondering how I have two little girls only five months apart, you can read more about that HERE. I have been married to my husband, Branden, for 6 years and I am a counselor at my old high school. I also love blogging, shocking! Feel free to check out more of my life on Instagram, Twitter and Facebook. When I was a little girl I remember looking forward to certain traditions my family had each year. One of my favorites was going to my Grandma's house with my sister and baking a huge batch of sugar cookies from scratch. We would then decorate them and box them up. We would take home some for our Christmas Eve party and then my Grandma would give out the rest. To this day it still makes me smile just thinking of it. I think traditions are one of the greatest things we can hand down to our children. Whether it is one that is handed down year after year or a new one you start with your own children. Here are some fun traditions you can start with your children. Birthday Traditions. With Ace we started two traditions, a birthday interview and a donut cake the morning of his birthday. I started doing this with my son Ace when he turned 3. It was the perfect age to start because he really understood most of the questions in the interview that I asked him and knew what a treat it was to have donuts. Now that he is 4 it is the second year I have done this and I look back on the year prior and see how much he has changed. 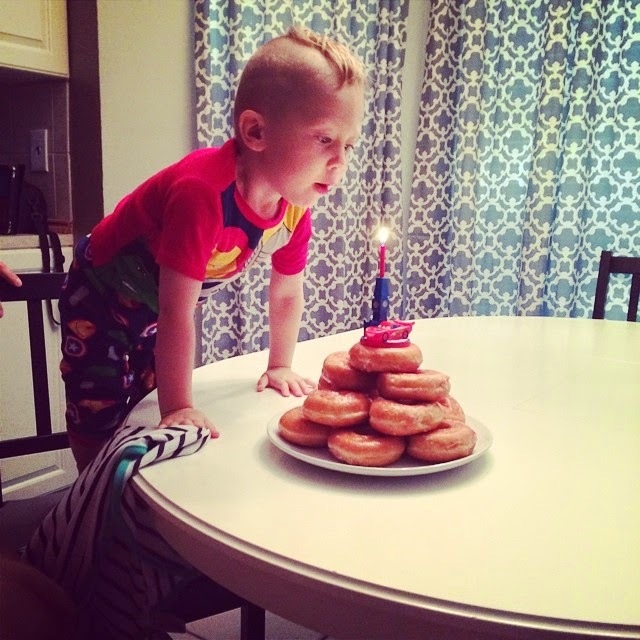 I have a picture of him both years with his donut cake and it just is so cute. I can't wait to see how his answers and how much he has grown next year. I will also start the donut cake for Ashlyn and Everly at their 2nd birthdays but stick with their 3rd birthday for the interviews. Back to School Traditions. This one can be anything. Whether you take your kids to get donuts the first day of school, out to ice-cream after the first day or week. Even a fun dinner after the first day. Anything you can think of to make that first week even more exciting. I actually had a parent tell me she would take her son and his friends to McDonalds the Friday after the first week of school and have a little celebration. She said her son still talked about this when he was graduating and how much he appreciated it. I thought it was such a cute idea. Having that special event, whatever it may be, to celebrate back to school can have a lasting impression on your child. 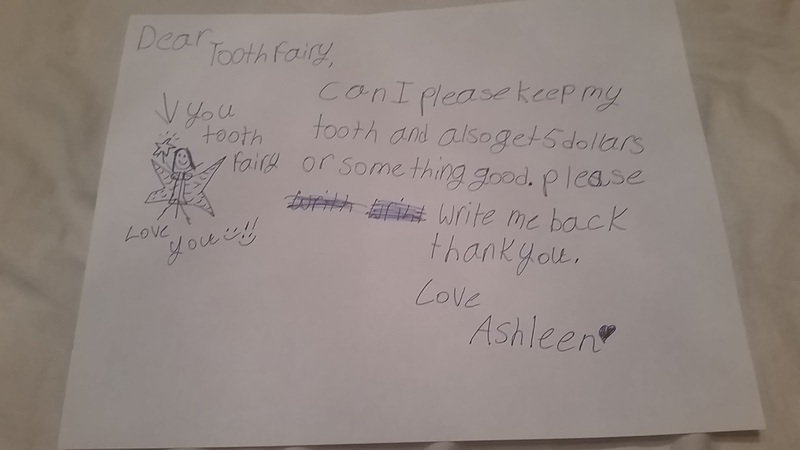 Letter from the Tooth Fairy. I have friends who actually told me about this. Once in awhile their kids will write a letter to the Tooth Fairy or the Tooth Fairy will write a letter to them. I thought this was such a cute idea. And how magical must this feel for a child? Bonus points for sparkly pens and fairy dust. There is also an app called I Saw the Tooth Fairy where your child can see a picture of them sleeping and the Tooth Fairy is by the child in the photo. My friend did this for her daughter as well, so cute! Family Movie and Game Nights. These might seem like obvious ones but making a conscious effort to plan out a fun family night with special extras can really make your child's night. Letting them pick out a movie, game and even some kind of special treat will be totally exciting for them. I know my son loves when he gets to make the decision on what we watch or what game we play. Yearly Letters to Your Child. I do this on my blog for each of their birthdays but don't actually write them out. I should probably print them and put them in their keepsake boxes but I figure at least it is getting done. I have heard people make emails with their child's name and write them emails yearly or when they reach a milestone. Then when they turn 18 they will give them the password to open the email and read them. I think this is such a great idea! I probably should do this so each of the kids have their own place for personal letters. What traditions have you started with your children? Thanks for sharing these great ideas with my readers, Brenna! I hope you all are having a great week!